The north end of Crystal Palace under construction on its new site at Sydenham Hill. 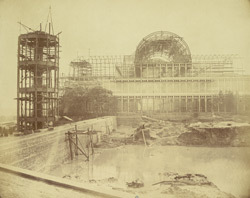 The palace was originally built in Hyde Park to house the Great Exhibition of 1851, a showcase for British arts and industries. In June 1854 the palace re-opened in south London as a national centre of entertainment and enlightenment for the British public.